Jump to a section below! Have a question not answered here? Head over to our frequently asked questions page for answers to commonly asked questions. During a round, people can purchase 1 or more keys which resets the timer marking them as the current leader. With each key purchase during the round, the key price increases slightly. Players receive a stream of passive income from the game as keys are bought during the round. There are two different game modes with distinct rules and round durations: Long and Soon. Players can select from one of four teams which determine certain rules in the round. Players can buy a vanity URL and/or refer your friends to the game for extra rewards. Visit the Fomo3D site and buy some keys! Running into any technical issues with Metamask? Please check out our newbie's guide to getting help. This is a game in which the grand prize winner is the last person to purchase a key before the countdown timer runs down to zero. (Soon version only) Each round of the fast version kicks off with a short 60-second ICO phase, during which all players will be able to buy keys for the same average key price, determined by the total amount of ETH invested during this phase. Once the ICO phase ends, then the normal round begins with the timer set and starting to countdown. During a round, a timer is constantly counting down to zero. Every time a key is purchased, the buyer becomes the new "holder of the private keys" and additional time is added to the countdown. The price of the keys will now start to get slightly more expensive with each purchase. When the timer reaches zero, the last person to have bought a key wins the round! At the end of the round, the ETH in the pot is divvied up: the winner receives half of the pot, with the rest split between all F3D players as well as to P3D holders. The specific way the ETH is divided between the F3D participants and the P3D holders depends on which team the winner was representing. (Long version only) Once the round ends, the game has a 1 hour grace period with transactions sent to the game passing through to your vault and key purchasing is disabled. This lets players realize what happened, and get into position to buy in early on the next round. To understand the mechanics and incentives of the game, check out Reddit's The Button experiment for insights. Fomo3D is essentially a lottery where the house advantage goes directly to players. There are two distinct modes of the Fomo3D game: long and soon each with varying rules and gameplay. The modes break down as outlined below. Keys are the main focus of F3D, You buy them directly from the contract and they change the way a round is played, and when/how a round will end. The game runs an internal timer which is constantly counting down to zero. When a key is purchased, the timer increases by a fixed amount and the player who purchased that key is put into the lead. Keys grant instant dividends on all volume that flows through a round, meaning you will constantly receive a stream of passive income from the game as keys are bought until a round ends. Keys slowly increase in price (along with how much of the final pot they're worth) as the round continues. You are guaranteed a portion of the exit-scam for every key you own, and betting on the final volume of a round can result in a tidy sum of Ethereum being deposited into your vault when someone wins. F3D Long is the flagship game mode, designed to encompass rounds that last days/weeks/months. Each key purchased add 30 seconds to the round timer, to a hard cap of 24 hours. Time is added per-key, rounded down. So 2.5 keys = 60 seconds. F3D Soon is the speed game mode, designed to encompass rounds that last hours or days. Operates with a short 60-second ICO phase at the beginning of each round, in which all players will be able to buy keys for the same average key price, determined by the total amount of ETH invested during this phase. Each round runs with a 5-minute timer. Any keys purchased put the timer back at 5 minutes. For more details, check out our Fomo Soon Mode page. In Fomo3D, there are four major teams that players can associate themselves with. Snek ( ) - "Trickle down Divinomics". Your key buy-in price will have a larger share distributed to P3D holders and somewhat less given to F3D players. After a round ends, a larger portion of the pot is distributed to P3D holders as dividends. Sneks push for distributing more as dividends to other players and to P3D holders and less to the pot. Whale ( ) - "Feed on the greed of others". Your key buy-in price will have a much larger share distributed directly to the ETH pot and less split to F3D players or P3D holders. After a round ends, a larger portion of the pot is held for the next round and less given as dividends to players and holders. Whales push for keeping more of the ETH in the pot and for future rounds rather than distributed as dividends. Bull ( ) - "Break upwards, never stagnate". After a round ends, a larger portion of the pot is distributed to F3D players as dividends. Bulls push for distributing more of the pot as dividends to other players and a smaller amount to P3D holders than Sneks. Bear ( ) - "Stand alone, fight alone". Choosing team bear is a veto against P3D holders. Your key buy-in price does not go to P3D and a larger share is distributed to F3D players. After a round ends, none of the pot will be distributed to P3D holders as dividends. Bears push for distributing dividends to other F3D players rather than sharing any with P3D holders. At the end of a round, after the countdown timer drops to zero, the winning team determines specifically how the ETH is distributed between the winner, all F3D players from this round, all P3D holders, and the remainder is left over for the next round. The winning team is the one selected during the purchase of the very last key in the round. This table distributes the majority of the incoming ETH from keys bought. The remaining ETH is always distributed: 10% to player's referrer (or to all P3D holders if no referral), 2% to the community fund (see more), 1% to pot swap, and 1% to the airdrop side-pot. Let's take an example for clarity: suppose the "Active Pot" was at 100ETH when you bought in and you purchase 10 ETH worth of keys and chose Team Bull. Since you chose Team Bull, 35% of your ETH (3.5 ETH) is sent to the pot, 43% of your ETH (4.3 ETH) goes to other F3D players, and 8% of your ETH (0.8 ETH) goes to P3D holders. To understand how teams affect the pot distribution, check the Pot Distribution section below. 2% of the Ethereum the final pot-winner would have otherwise gained, is sent over to the community bank fund, which pays out great community members who make this game possible. This fund is dynamic and new community members can be added anytime. 48% of the active pot goes directly to the round winner's vault for them to be able to withdraw anytime! Let's take an example for clarity: suppose the "Active Pot" was at 100ETH when the final key was purchased before the timer reaches zero and the winner chose Team Bull. The winner would receive 48% of the pot (48 ETH) directly into their vault. Since the winner chose Team Bull, 10% of the pot's ETH (10 ETH) is kept for the next round, 30% of the pot's ETH (30 ETH) goes to other F3D players, and 10% of the pot's ETH (10 ETH) goes to P3D holders. Fomo3D directly benefits all P3D holders by paying out dividends to all holders each time a key is purchased and also every time that a round ends (unless Team Bear wins). The amount of the total pot that is paid out as dividends is determined by the team that wins. If you'd like to maximize the dividends to P3D holders, then you would want to play on Team Snek. Purchase P3D tokens, the higher the share of tokens you hold, the more dividends you earn. Each time a new key is purchased, all P3D holders receive a portion of the sale as dividends. At the end of every round, all P3D holders also receive a portion of the pot as dividends proportionate to the % of P3D tokens held. For more information on purchasing P3D tokens, check out our Getting Started guide. The Fomo3D referral system is called the "Advisory Board". To join the advisory board, click the "Vanity Name" link at the top and then pick a nickname for yourself. Joining the board costs 0.01ETH which is contributed to the "community fund" and distributed to developers and community staff. Note that you must register a vanity name to receive referral rewards ("Bad Advice") in your vault. This name will show up on the leaderboard, and at the top if you are the current holder of the private keys. Your vanity name is also included in the referral URL you share with others. Your names, your player ID and your wallet address will all work for referrals (i.e https://exitscam.me/<id/address/name>). Once you are an advisor, you can copy your referral link from the "Vanity and Referrals Tab" and share that with friends or members from other discords. You will earn 10% of all the ETH put into the game by anyone that joins F3D through your link. This referral fee is paid to you for everyone you refer for all of their buys and reinvests. And this is all at no cost to them. In F3D, referral links used by players are stored within the smart contract itself meaning that you will receive the referral fee for buys from all players you referred even across browsers or different computers ensuring that those marketing the game can receive substantial residual income over time from players. Essentially, FOMO3D referrals are super-sticky. You will continue to receive referral rewards from someone up until the point they purchase using someone else's referral link. In the event that a player purchases keys without using a referral code and has never used a referral code previously, then that referral fee is instead paid as dividends to P3D holders! When purchasing keys in the "Purchase" tab, you'll notice some text alerting you to the chance of an "airdrop". For example, the text might read: "5% chance to receive a 1 ETH Airdrop with your next purchase!" 1% of all incoming ETH goes into an airdrop side-pot. Each time you purchase keys, you have a % chance of receiving a portion of the airdrop side-pot ETH siphoned directly into your vault. The global chance of receiving an airdrop starts at 0% and increases by 0.1% for every key order (or purchase) over 0.01 ETH. (Note, if you win an airdrop you are receiving ETH directly to your vault, and not extra keys). Once your purchase transaction completes on the blockchain, you'll be alerted if the airdrop multiplier was successful on your purchase. Be aware that you are competing with other players to receive these airdrops. Once any player receives the airdrop, the chance for everyone resets! (Soon version only) Rounds begin with a short ICO phase, during which all players will be able to buy keys for the same average key price, determined by the total amount of ETH invested during this phase. Once the round begins, purchase one or more keys using ETH which immediately makes you the "private key owner" until another person takes the keys from you. 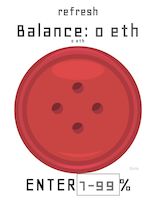 All the ETH you earn when a round ends as a winner or a player is then stored for you in "The Vault". Referral rewards ("Bad advice") are also stored in the vault. You can withdraw ETH from the vault anytime to your Metamask wallet. Please note that only purchasing 1 or more keys will mark you as the current private key holder otherwise you will still receive dividends but will not have a chance to drain the contract. Private keys - These are the "tickets" you purchase during the game. Each key you buy puts you into the lead until someone else buys a key. The more keys you have, the larger the share of the pot you receive when the round ends. Note these are not real private keys. Think of them as tickets during the round. Airdrop - This is the chance to bag some free ETH distributed directly to you! Every time you buy a key, you have a chance of receiving the "airdrop", which is a proportion of the air drop pot which grows steadily during each round. Exit scam - This is the end of the round after the timer reaches zero when the ETH pot is distributed between the winner, F3D players and P3D holders. The "exit scam" is the pot being paid out to all of the various parties. Advisory Board - This is the name for any player that has purchased a vanity name and has a referral link they can share with people earning them 10% on all keys purchased by those they have referred. Please keep these terms in mind when reading the rest of this guide. Still have unanswered questions? Head over to our frequently asked questions page! F3D leverages a "big red button" which allows a percentage of incoming funds to the contract to be distributed to P3D holders as dividends. These funds sent to P3D are then disbursed by activating the bridge contract (through a button). This contract is what we refer to in the P3D ecosphere as a bridge. This acts as a way to add external dividends to P3D from any other Dapps. If you are a Dapp developer and would like access to the massive marketing power of the P3D community, check out our libraries guide here and/or talk to @Justo_Bot on Discord about access to an SDK and more information about integrating this into your Dapp. You can also contact us via email at teamjust@protonmail.com. Don't forget that the P3D community is the largest and most powerful group of marketers in the Dapp community. The biggest strength of integrating the big red button into your Dapps is that by providing a tiny portion of divs to P3D holders, you are now able to get the support of the P3D community for your Dapp and they'll happily advertise for you. Interested in learning how to make your own distributed blockchain apps? Anyone can learn if they are willing to put enough time and energy! Check out our introduction to Dapp development for a great starting point and links to resources. Have feedback or want to reach out? Ping @Cryptoknight on the Team Just Discord or email me at cryptoknighte@protonmail.com.